NEW YORK – I have been very disturbed by the trend I have seen with Big Blue lately. I have lost that sense of security that the Giants will overcome whatever is thrown at them. These feelings have festered for one reason alone and that is the fact that the Giants are not beating the teams they should be destroying. Here we are with five games left in the season and the Giants are sitting at 7-4 and tied for first place in the NFC East with the Philadelphia Eagles. Quite honestly, they are lucky to be where they are at because they could have easily lost the Jaguars game last week. The Giants won the game against the Jaguars but they did not beat them. Now, most fans would say “Hey, they are in first place and coming off a comeback win, what are you complaining about?” First of all, I am not complaining about anything, I am simply pointing out the fact that the Giants are not performing to the level of talent on the team. I am concerned with the lack of performance in the 1st and 2nd quarters specifically. We are very aware of the fact that Big Blue has suffered a number of injuries and have lost a ton of talent for the entire season. I’m positive that this has led to the backup players making a lot of mental errors because they were thrown into the starting roles they now own. The Giants lead the entire NFL in turnovers with 30. They are also getting way too many penalties, even though the refs have blown many of the calls this year. Both of these horrible statistics can be attributed to mental errors, something that head coach Tom Coughlin is not known for. When I say that the Giants need to find a sense of urgency, I am simply asking the team not to believe their record of 7-4. I do not mean to insult anyone inside the Giants organization. Obviously, we are all huge Giants fans here at nygreporter or we would not have this family friendly Giants website on the internet. The team needs to hear the fans when we say that the past 3 weeks have been ugly. I truly believe that this is the most crucial point in the 2010 season and the G-Men have to understand that it can all end very abruptly if they do not play like their season is in jeopardy, because it is. If the team does not adopt this sense of urgency and play with a deeper purpose and focus, then I think the season will end as a major disappointment. The Giants will need to win three out of the five remaining games (including three division rival games) to finish at 10-6, something that doesn’t guarantee a playoff spot but should be enough to squeak in. The Giants play the Redskins next in New Meadowlands stadium this Sunday at 1PM EST. THE NEW YORK GIANTS ARE HAVING A CONTEST TO WIN TWO TICKETS TO THE SUPER BOWL!! CLICK HERE FOR MORE INFO. ALWAYS READ THE OFFICIAL RULES OF ANY CONTEST, GOOD LUCK! NEW YORK – The New York Giants were coming off back to back losses to division rivals and they needed a win badly. I did not think this would be an easy game because Jacksonville has some very talented players on their team, including RB Maurice Jones Drew. But the Jaguars kicked the crap out of the Giants today in every area of the game. The Giants gave a pitiful performance once again for the first three quarters, then seemed to come to life in the fourth quarter. They cannot continue this new trend of laying down for three quarters and hoping to come to life late in a game to save the day. It will not work and they will not make it back to the playoffs playing like this. The Giants won this game 24-20 but they won ugly. There are still way too many mental errors being made. The turnovers (Giants lead NFL with 30) and penalties are killing Big Blue this year, couple that with the enormous loss of talent to the IR list and a middle of the road team is what you are left with. The Giants have become a mid level NFL team. It pains me to admit that because I am first and foremost a fan but there is no denying what I have seen with my own two eyes. The Giants are going to have to win back my trust and prove me wrong. I understand the injuries to starting players are very difficult to overcome but it is much more then that. I am still rooting for them to win every week and have not lost faith in Big Blue but they need to play better. The amount of dropped and tipped balls by the WR’s and TE’s are completely unacceptable. This is an area of the game that is overlooked sometimes but not by me. The team needs to work on this just as much as they concern themselves with all of the fumbles. Dropped and tipped balls kill drives the same way a fumble does. The lack of energy and sense of confusion permeating off the G-men is what is upsetting. I don’t mind if they lose a game straight up but I loathe losing games due to mistakes. The Giants won the football game today and raised their record to 7-4. They will try to keep things rolling when the Redskins come to New Meadowlands stadium next week at 1PM EST. – QB Eli Manning had another decent game and finished with 226 yards 2 TD’s 0 INT’s. – RB Brandon Jacobs got the start today and had a good game. He finished with 87 yards 0 TD’s. – TE Kevin Boss had a great game and finsihed with 74 yards and a huge TD late in the game. – RB Ahmad Bradshaw had some good runs at key moments and finished with 49 yards 0 TD’s. – WR Mario Manningham had a good game as the No. 1 WR and finished with 61 yards and 1 TD. – DT Barry Cofield had a nice game and seemed to be in on every play today, even though the stats don’t show it. – S Deon Grant led all defensive tacklers with 8 today. Grant was a huge off season pick up who has emerged as a leader. – K Lawrence Tynes had another perfect game (3/3) and has completely redeemed himself in my opinion. – Rookie P Matt Dodge continues his see saw season with another up and down game. – The Giants make shift offensive line did not give up a sack the entire game. – TE Travis Beckum had a nice catch for 29 yards and seems to be getting more work on offense. – DE Justin Tuck was all over the field today and made some very big plays. He also shared a sack with Antrel Rolle. – OC Kevin Gilbride continues to disappoint with his conservative offensive play calling. – DC Perry Fewell continues to impress with his defensive schemes and game instincts. – The Giants defense had a better game statistically, then it looked like live on TV. They finished with 4 sacks 1 INT 3 forced fumbles. – Rookie DE Jason Pierre-Paul had a great game including a key play in the 4th quarter. He also had 2 sacks. – The Giants special teams needs a complete overhaul. I’m not sure if it’s Tom Quinn or the players but somethings gotta give. – The Giants are still turning the ball over way too much, in fact the lead the entire NFL with 30. The amount of penalties are getting ridiculous as well. 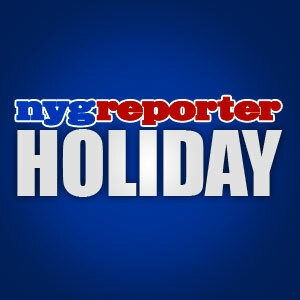 NEW YORK – Everyone here at the nygreporter would like to wish all of our readers a very Happy Thanksgiving! I hope that most of you will be with family and enjoying some great food and good company. For those of you who are unable to be with family, for any number of reasons, you are not forgotten either. Especially the men and women serving our military overseas. We are thankful for the service our military provides to keep America safe and strong. I hope that our readers remember the reason for Thanksgiving and can perform a random act of kindness to someone who truly needs it. These are rough days we are living in and you would be surprised by how much it means to some, to receive a simple act of kindness. Be thankful that you are able to have such a charmed life in this great country of ours and keep your head up during these hard times. I hope that you all enjoy some great food and drink and the football games that have become a part of the Thanksgiving tradition. There are some really good games on today, including our division rivals, the Dallas Cowboys facing the red hot Saints. Dallas (3-7) isn’t a real threat to our standings but it would be nice to watch them lose on Thanksgiving anyway. God bless all of you and your families and don’t forget that the New York Giants will face the Jaguars this Sunday at 1PM EST at New Meadowlands stadium. Fans will anxiously be expecting a victory against Jacksonville to bring the team back on track. If ever there was a must win game, this is it. I predict a 34-17 Giants victory. DON’T FORGET OUR MILITARY ON THIS HOLIDAY, PLEASE SUPPORT THE WOUNDED WARRIOR PROJECT! NEW YORK – The New York Giants were coming off an embarrassing loss to the lowly Cowboys last week, while the Eagles were coming off a record setting victory against the Redskins. Both the Giants and Eagles were tied for first place in the NFC East with 6-3 records. Football fans expected an excellent game and depending on who you were rooting for, you got what you asked for. The Giants lost 27-17 in another heartbreaker. This game was harder to watch then the loss to the Cowboys last week. The first three quarters were like watching a car accident for Giants fans. Nothing was going right for Big Blue and the mishaps multiplied with fumbles and penalties and turnovers. Head Coach Tom Coughlin looked like his head was going to explode on the sidelines and mine was throbbing too at one point. The special teams play was atrocious once again and OC Kevin Gilbride was being too conservative in the first half. DC Perry Fewell did an incredible job handling the explosive Eagles offense the entire game. QB Michael Vick was contained about as well as you can contain that guy. The Giants defense played a great game but came up particularly huge in the fourth quarter. In fact, the entire Giants team seemed to come to life in the fourth quarter. They were playing with a seriously banged up offensive line, not to mention 11 players resting comfortably (not) on the IR list. This second straight loss to division rivals in the past two weeks has fans scratching their heads and wondering why the team is not performing at the level they should be at. – QB Eli Manning had a very poor game and finished with 147 yards 2 TD’s 3 INT’s 1 fumble. Eli also had 22 rush yards. – The Giants defense was the true star of this game. They finished with 3 sacks and 2 forced fumbles. – DE Justin Tuck had an awesome game finishing with all 3 of Big Blues sacks. – RB Ahmad Bradshaw had a below average game tonight. He finished with 29 yards 0 TD’s 2 fumbles. – Rookie punter Matt Dodge was up and down all night. This kid might not be with the team next season. 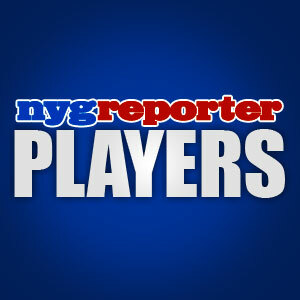 – WR Hakeem Nicks had a decent game but below his standards. He finished with 65 yards 0 TD’s. – DC Perry Fewell deserves the game ball for this game. His game plan was phenomenal. – The Giants special teams are simply atrocious and need a complete overhaul soon. – TE Kevin Boss had a decent game and finished with 22 yards. – TE Travis Beckum got a little involved and finished with 2 yards 1 TD. – WR Derek Hagan, who was brought back to replace Ramses Barden who landed on IR, had 10 yards 1 TD. – CB Terrell Thomas had an incredible game and led all tacklers for the Giants with 9. – RB Brandon Jacobs had a poor game and finished with 10 yards 0 TD’s. – WR Mario Manningham was quiet for most of the game and finished with 24 yards. NEW YORK – It’s going to be a hazy shade of winter for the Giants with all of these recent injuries. There are now 11 players who have landed on the IR list and we have only four healthy WR’s, including WR Derek Hagan who came back to the team after WR Ramses Barden was ruled out for the season. There is a lot of talent resting on the IR list year man. It’s getting too difficult to cut players from there. Welcome back Derek, it looks like No. 80 is still available. I expect the New York Giants to dig deep and defeat the Eagles this Sunday night (8:30 PM EST) in Philadelphia. I think what happened last weekend against the Cowboys was a huge wake up call for the Giants talented “UFO Backfield” (my nickname for the DB’s) who are flying around out there getting balls. They were taken by surprise by the lack of a pass rush up front. I have to admit I was surprised as well. I thought the G-Men would win this game by two touchdowns minimum. I’m glad the backfield got this game out of the way against an inferior football team, because they have a tough stretch the rest of the way. I give DC Perry Fewell props for sticking with the players in the backfield and not blitzing more. This was a test for our secondary and they were held to the fire a little bit. It will serve them well for the remainder of the season and into the playoffs. I expect that pass rush to return against the Eagles this weekend (I predict 2 sacks, 2 INT 1 forced fumble for the G-men). QB Michael Vick will not do to the Giants, what he did to Washington. Although, that was one of the most incredible performances I have ever seen by any professional football player. That was exceptional and something I will never forget. The fact that he was playing McNabb only makes it more memorable. Big Blue will put the Cowboys game behind them and take sole possession of 1st place in the NFC East, which they now share with Philadelphia at 6-3 each. Manning vs. Vick will be a nice matchup for Sunday Night Football. – On a side note, FOX Sports needs to do something about the Troy Aikman and Joe Buck tandem calling New York games. There is something very wrong with that. I suggest replacing either troy aikman or Joe Buck with Michael Strahan for the LIVE games. I would prefer he replace Joe Buck first and if not him then Troy Aikman. I don’t care about how you feel about Troy Aikman, you still have to respect what he did on the field, Joe Buck has become very annoying to me lately. Michael Strahan is ready to cover LIVE games. THE NEW YORK GIANTS ARE HAVING A CONTEST TO WIN TWO TICKETS TO THE SUPER BOWL!! CLICK HERE FOR MORE INFO. ALWAYS READ THE OFFICIAL RULES TO ALL CONTESTS, ENDS DEC 27, 2010 GOOD LUCK!